Bhubaneswar: Defying police arrest, thousands of farmers under the aegis of Navnirman Krushak Sangathan (SK) held a week long protest rally from today. 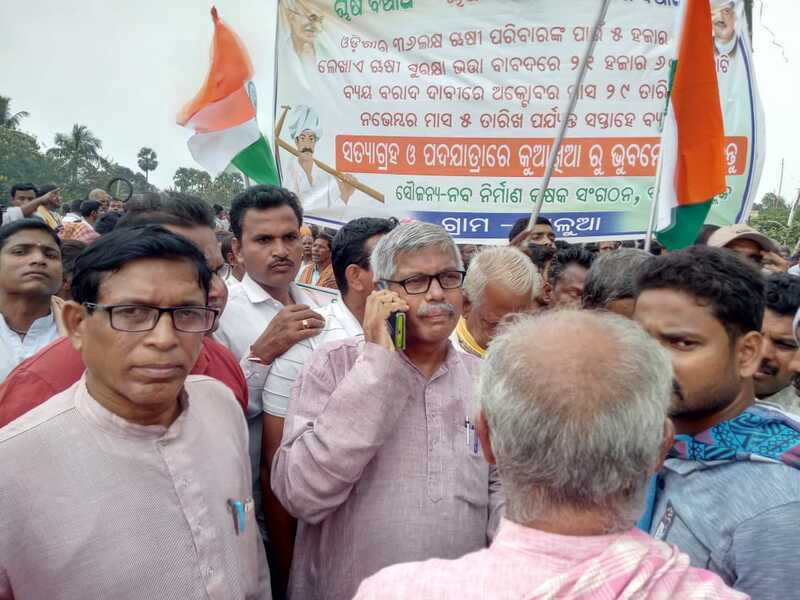 The farmers have started ‘Padayatra’ two locations, one group from Balugaon in Khurdha district and another group from Kuakhia in Jajpur district. ‘The state government plans to sabotage the movement. Police have arrested many of our workers. They have also detained farmers at bus stops and railways stations. It is unjustified and undemocratic,’ said Akshaya Kumar, national coordinator of NKS. However, more than 20 thousand farmers have joined in the rally and are moving towards Bhuabneswar. They plan to reach the state capital by 5 November. ‘We don’t know why the government wants to detain us. We are holding peaceful rallies. If the government doesn’t listen to our demands, we will continue our protest,’ said one lady farmers who has joined in the protest march. The Krushak Sangathan demands price, prestige and pension for the farmers. They are demanding a mechanism to be developed to ensure fair price for the produce of the farmers. The farmers are also demanding a pension to each family.